Hong Kong—The 8th annual Kerry Properties Ice Hockey 5’s adult tournament concluded on Saturday May 9 with the remainder of the round robin matches, semi-finals and finals for the eight divisions: International A, B and C; Asian A, B and C; 40+ and women. The 39 participating teams came from 17 different cities in Asia and around the globe including Australia, Canada, China, Japan, Indonesia, Philippines, Qatar, Thailand, Singapore, UAE and USA. This year’s tournament saw the return of the Sydney Stingrays from Australia (International B) and the debut appearance of the Zero Pucks women’s team from America. Of the five teams in the top level competition, the multi-national Pandoo Nation (from Singapore) and Abu Dhabi Theebs stood out during the round robin matches with both of these teams winning comfortably in the Round Robin stage.. They were also equal when they played each other in the early stages of the tournament with the match ended in a 0-0 draw. Hong Kong Tigers also had some clear winning games but still could not hold the top two teams in check in the head to head meetings. The inevitable finalists after the round robin matches, Pandoo Nations and Abu Dhabi Theebs produced another very close match in the final with Pandoo Nations just coming away with a 3-2 win. Last year Pandoo Nation lost to HK Tigers in the semi-final but this year they improved to take the top prize. Last year’s winners Kreuz Subsea Sharks also from Singapore did not participate this year. Cathay Flyers, Nordic Vikings and Tinderwolves all had some high scoring wins in their Round Robin matches. Cathay Flyers beat the previously rated Sydney Stingrays 6-1 and then again 10-0 in the Quarter Final Qualification while Tinderwolves had an 8-1 win against Singapore Spitfires but lost 3-1 to Nordic Kings. Kung Pow Kings beat Tinderwolves 3-2 in the first Semi-final while Nordic Vikings overcame Cathay Flyers 4-0 in the other semi. In the final Kung Pow Kings scored an early goal and maintained that lead until just seconds from full time when Nordic Vikings finally found the net making the score 1-1, to push the game into overtime. The deadlock could still not be broken after two OT periods of 5-minutes when both teams were reduced to 5-players. A penalty shootout ensued. The Vikings nailed each of their first four shots but the Kung Pow Kings faltered. Vikings won the shootout 4-1 to win the cup. There were only 4-teams in this division: Hong Kong Hitmen, Singapore Hawkers, I-Guard Knights and Hong Kong Swingers and head to head results varied quite a bit in the early rounds but I-Guard Knights and Hong Kong Hitmen showed the strongest pedigree coming through to contest the final. 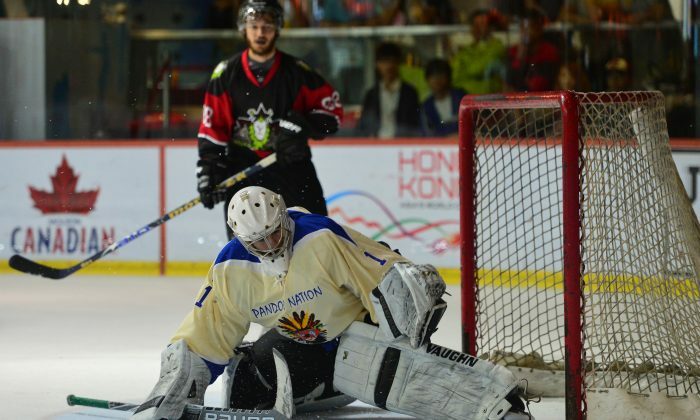 Hong Kong Hitmen defeated the I-Guard Knights with an OT goal to finish unbeaten throughout the tournament. Although the well fancied Singapore Hawkers won some games by a big margin they lost to both of the finalist in their Round Robin matches. The Asian A final from 5-teams was another close encounter between Kung Pow Kings and Gold Club, with Gold Club winning in a shootout after the game was 0-0 at full time and after OT. In Asian-B the largest division of the tournament with 11-teams, Gold Club beat Tokyo Mavericks with an overtime goal in the final to give them a 1-0 result. Abu Dhabi Storms came through the Quarter Final Qualifier and the Quarter Final by beating both Bravo and Zero Pucks Given 3-1and then defeated Bankok Zeus 4-0 in the semi-final while WIHO Angels overcame Pilipinas 5-0 in the other Semi-final. The final pairing of Abu Dhabi Storms and WIHO Angels produced a close result. Abu Dhabi Storms did not seem to have enough firepower to compete with the WIHO on an equal footing and defended courageously for most of the match with their goalie playing a tremendous game blocking shots from all angles. WIHO Angels were winning 1-nil but the Storms had a breakaway in the 2nd period to equalize the score and then withstood a period of battering but held out until full time. But in the OT with the teams reduced to 5-players, the WIHO Angels got the golden goal winner to take the trophy.